During a trip to the Schomburg Center for Research in Black Culture in Harlem in 2010, I found my father. After more than four decades of searching, it turned out he had long been within reach. No, my dad – Ebenezer Ray – was not an absent parent. He lived in the house on Shawnee Street in Pittsburgh with my mother, Mary, sisters Ellen-Marie and Marian (now Malaya), and me until his death in 1967, a week after my 13th birthday. 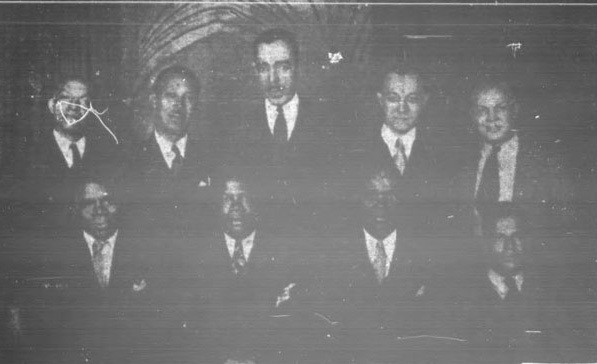 I knew he was born in 1897, immigrated to the United States from Barbados, and had lived in New York for many years before settling in Pittsburgh, where he met and married my mother, a much younger woman. My most vivid memories are of my father sitting on the sofa in our living room, four females twirling, chirping, bickering around him. He was largely housebound and unhappy. I was young and oblivious. He and I rarely talked. As I got older and it was clear I was destined to be a writer, my mother and my father’s friends would tell me how proud “Ebbie” would be that I was following in his footsteps. For decades, I lamented the fact that I had not had the foresight to talk to him about journalism, that I’d never read anything he’d written and probably never would. But thanks to the wonders of the World Wide Web, I stumbled upon an honors thesis that quoted a column he’d written in 1940 for The New York Age, a black weekly founded by T. Thomas Fortune. I found another, an academic article that quoted a column my father had written for the same paper in 1939. 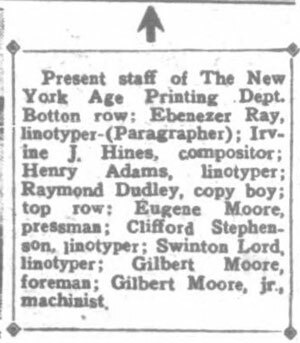 I headed for the Schomburg with the intention of finding those two articles – I still assumed my father was a printer who wrote an occasional article – but as I rolled the microfilm reel, it was clear I had hit upon a treasure trove. My father was a reporter and a weekly columnist for the Age for about 20 years, from 1925 – 1945. 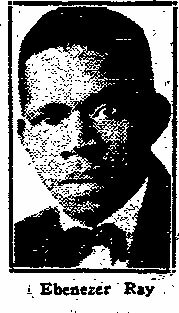 I now know the name of his mother, Malvina Alkins, whom he mourned in print when she died in 1936, and his first wife — I assume she was his first — Lucille Manning, whom he married in 1939. How ironic that as my ink-stained colleagues and I lament the demise of print, the most exciting development in my life as a journalist involves learning how to use a microfilm machine to decipher very old hot type. I have created this blog to preserve my father’s legacy as a newspaper man and most of all to explore the history that is so much a part of me. I so much enjoy reading about your quest to find out more about your dad. Elaine, stumbled upon your blog and looking forward to savoring it. What a discovery! Thank you, Janet. It has been quite a gift. Great to hear from you. How is life? How is Basab? Hey, Otto. How are you? Thank you for the sweet note. I hope to see you next time I’m in Atlanta. I’ll let you know ahead of time. First of all, this website and/or blog is one of my personal favorites. I admire your family history, your tenacity to keep it rich and going for the world to see, and I find it all absolutely fascinating. Second of all, your sister, Nana Malayaa, has an addictive personality that shines through in all she does. Finally, your nephew, Lamman Rucker is one of my favorite actors and his work speaks well for itself but I feel such a connection to your family that it’s eerie. But keep doing what you’re doing and more power to you! I stumbled upon your blog from a comment you made about Blacks in media and clicked the about page for more info. Thank you for your kind words. I hope you will keep reading. Suggestions welcome. What an interesting and wonderful blog you’ve created here! I love your father’s wit! I share your awe and excitment in finding the gems and tidbits about your family history, as I’m on the same journey. This is great, Elaine. What a gift it is to be able to connect this way with one’s past and find that, in your own way, you are continuing an important legacy that is a part of history. Thank you, Henrietta! I hope you are well. I am so inspired by you! I am proud to see your passion for your family. Thank you for sharing! And thank you for sharing your blog. I look forward to reading more. This is so intriguing, I am enthralled by your journey as well as your father’s writings. What an awesome experience…thanks for sharing! Elaine, this is beautiful. I look forward to reading more. I am very interested by this and I hope that you’ll continue to research your father’s writings and his past. I can sense a fascinating story here that will also shed great light on your own story. I feel the same way about my father’s family. His parents died very young and I didn’t get much of a sense of most of his family memories before he, too, passed.